My manufacturing process is always sometimes evolving. It’s not a complicated one, but there’s enough steps and nuance that I benefit from reminding myself what I’m supposed to be doing. A run of bad Polarshields last year prompted me to start being a lot more careful about how I assembled and recorded the assembly of them. I started putting little journals on each one, which were just a strip of sticky tape with any story on them. Anybody who bought a Polarshield will have found such a thing. I recently kicked myself a couple of times in a row when I thought I’d forgotten to test a certain aspect of the board, and had to open up a pile of sealed parcels to find out. Fortunately in that case, there was no problem, but I made up some new labels to help me not make a mess in the future. The evolution is in the pic. 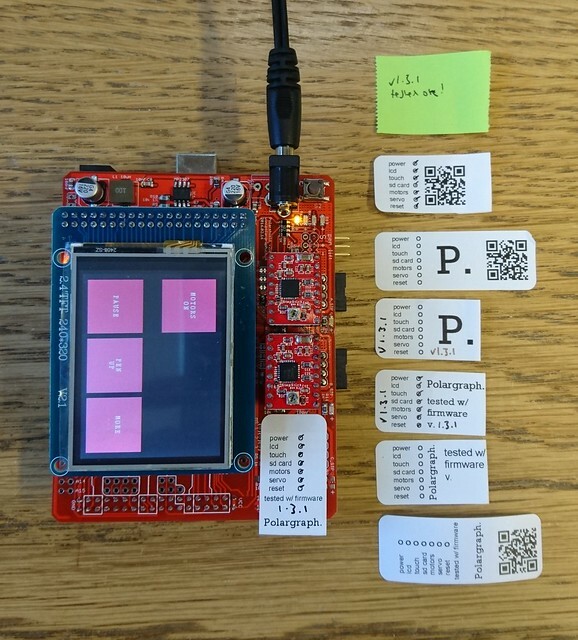 The QR takes you to Building a Polargraph from a vitamin kit on the wiki. The final version is less handsome, but more useful, and there’s a beauty in that trade-off. I like seeing these kinds of “work in progress” pics on other makers’ blogs. This entry was posted in business, machine by sandy. Bookmark the permalink.